CCRT Notification 2018.Centre for Cultural Resources and Training,Ministry of Culture, Govt. of India has released a notification for the award of Scholarships for young artistes of outstanding promise in the fields of Indian Classical Music, Indian Classical Dances, Light Classical Music, Theatre, Visual Arts and Folk, Traditional and Indigenous Arts.Check the eligiblity and notification prior to apply for the positions. Please note Applications are invited for the year 2018-2019 with effect from 12th November, 2018. There are 400scholarships available for the current year. Details of the schemes, instructions for applicants, eligibility conditions/ criteria and Application Module are available on the following websites of the Ministry of Culture, Government of India and CCRT. www.indiaculturtnicsin ; www.ccrtindia.gov.in. 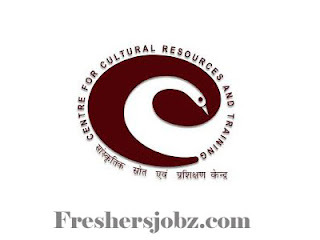 Centre for Cultural Resources and Training, 15-A, Sector - 7, Dwarka, New Delhi - 110075.